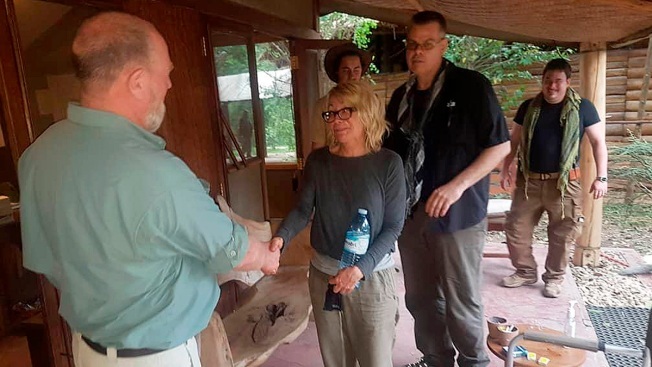 An image released by Wild Frontiers tour company on April 8, 2019, shows American tourist Kim Endicott, center, after she was freed from capture by unknown armed kidnappers in Uganda's Queen Elizabeth National Park. Ugandan police said on Sunday they had rescued Endicott, an American tourist, and her guide, Jean-Paul Mirenge, who had been kidnapped by gunmen in a national park. U.S. President Donald Trump on Monday urged Uganda to find the kidnappers of an American tourist who has been freed amid conflicting reports over whether a ransom was paid for her release. Kim Endicott of Costa Mesa, California, was released by her abductors over the weekend and was to be turned over to the U.S. ambassador Monday, Ugandan police said. Endicott and her Ugandan driver were both safe after the five-day ordeal. They were taken from Queen Elizabeth National Park across the border to Congo, according to Ugandan authorities. Trump pressed Uganda's government to capture the culprits Monday. "Uganda must find the kidnappers of the American Tourist and guide before people will feel safe in going there. Bring them to justice openly and quickly!" he tweeted. Over the weekend, Trump tweeted that he was pleased the tourist and guide had been released. Ugandan police spokesman Fred Enanga said he did not believe a ransom had been paid. "I have indicated to you that we don't do ransom," he said Monday at a news conference in the Ugandan capital of Kampala. A Uganda-based tour official said, however, that a ransom was paid to secure Endicott's freedom. The tourist was released, "not rescued," after money was paid "otherwise she wouldn't be back," said the tourism professional with knowledge of Endicott's trip. Benton called Endicott an adventure seeker and world traveler, saying it wasn't surprising that she would travel to Uganda on her own. Megan Barth, a longtime client and friend of Endicott's who lives in Las Vegas, said Endicott is an animal lover who long dreamed of traveling to Africa to see gorillas in the wild. "It was definitely on the bucket list for her," Barth said. "She's a wanderlust, and she's always been a wanderlust. She always was wanting to travel and experience different cultures." Barth said she's been overcome with worry since Endicott was kidnapped. "Over the past week, I've just been praying — praying in the shower, praying while I'm driving, praying while having my cup of coffee," she said. "My whole entire day was consumed by her because I knew she was in such an awful, traumatic place." Benton and Barth said they hope Endicott isn't too scarred by the experience and is touched by those worldwide who have reached out to her family while she was held. Barth said if anyone can make it through such an experience, it's Endicott. "She's such a lovely, warm-hearted, beautiful spirit," she said. "She will somehow turn this traumatic experience into something that is not only a healing experience for her, but an experience she can use to help others." Endicott, who has a small skin care shop in Costa Mesa, is in her 50s and has a daughter and granddaughter, according to Phoenix resident Rich Endicott, who told The Associated Press that he hadn't spoken with his cousin since a family reunion several years ago. U.S. Secretary of State Mike Pompeo said last week at an event for families of U.S. citizens held captive overseas that he understands some people want to do anything to get their loved ones back but paying ransom would just lead to more kidnappings. Queen Elizabeth National Park, which is near the porous border with Congo, is Uganda's most popular safari destination. Its attractions include groups of tree-climbing lions.